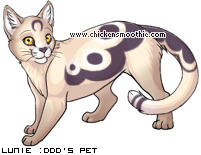 x3 I happened to be roleplaying this certain roleplay on WCRPG's Other Roleplay [Warrior Cats Roleplay Game] and it's so fuuuuuuuuuuuuuuuuuuuuun... And addicting x] So.. Ya, explained below. 1. Follow Pack rule's.. duh! 4. Being an Angel doesn't nessacarily mean this indiviual is good, nor does being a Demon mean they're nessacarily bad x3 Lets get that straight right now, amigos. 5. Please keep it at 5 characters, please? You can only have more if you can handle it, and it's a better idea to start with one or two characters to see if you like the roleplay or not. Personality : Kolby has a very sarcastic, and cocky personality, but he is truely a soft heart. Personality : Kodi is very quiet, but tends to be quite kind. She rarely ever shows any other emotion than happiness. Other? : She always wear a key necklace. Username [Pfft x3] : YOURSERIOUS? Personality : Cocky, sweet, innocent, rep as boy stealer. Angel or Demon [Duh -.-] : Angel. Other? : She acts like the devil, but nu. And she has epical hair. And she has a twin. Other? : Twin named Kyraa. And them just together as sisters. Kodi yawned boredly, twirling her hairs with her fingers. Personality : Gwen is a dark and dower person. She never really sees the bright side of things. Weaknesses : Talking, Doing anything that involves other people. Personality : She is a bit of a downer, but loves to help others, as long as they don't try and hurt her, in any way, for how she is. Angel or Demon [Duh -.-] : Angel! Other? : Not that I can think off. Ericka stands up, moving through the class silently, her feet barely naking a sound. Gwen watches her sister, glaring at her. Idiot. She's got to try and make things right. She thinks. Kyraa awoke, seeing her sister was asleep. She gazed at the clock, seeing it was past the alarm. Within a second, Kyraa was up, and went to her sister, Angelicaa's bedside. "Ang. Ang... ANGELICAA!" Kyraa yelled. Angelicaa was having a good dream. She dreamed- Bam. She woke up, on the floor, with her derriere hurting. "Wha..?" She was dazed, then her vision cleared, seeing Kyraa. "Kyraaaaaa." She whined. 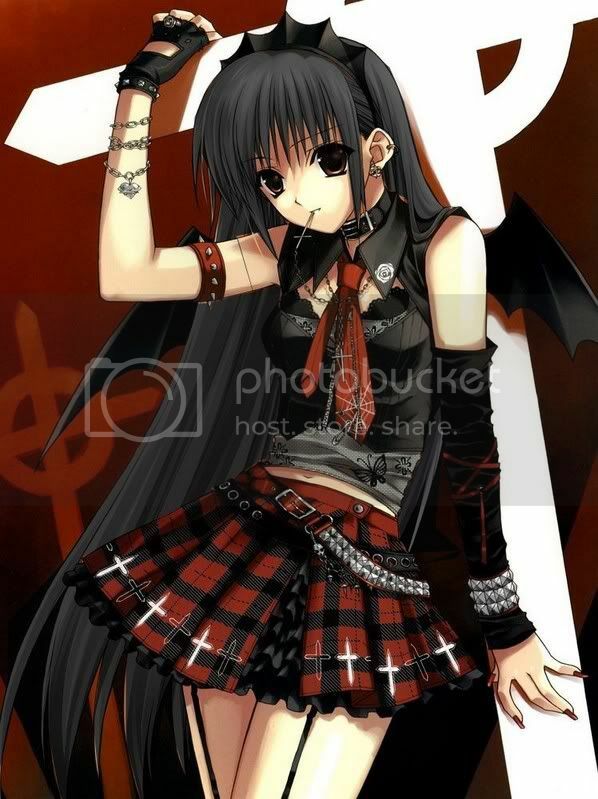 Gwen sighs, and walks out of the room, slamming the door behind her. "Idiot," She growls to herself, and walks down the hall, her head down. Ericka watches her sister and sighs. "She should behave herself," She whispers. Kodi grumbled when she woke up, her eyes blurring and twisting her vision. She groaned again, and slammed her head into her pillow again. Kolby, who had already managed to get up, was already moving towards the door. He quickly opened it, but grumbled as a sudden cold breeze hit him. Ericka opens the door, and smiles at the weather. "Come on, Gwen," She calls. Kolby grumbled to himself, "Its so cold.." He preferably didn't care nor like coldness, it was an annoyance. He quickly moved towards the sidewalk, turned, and started walking. Kodi pulled herself up, then grumbled again. 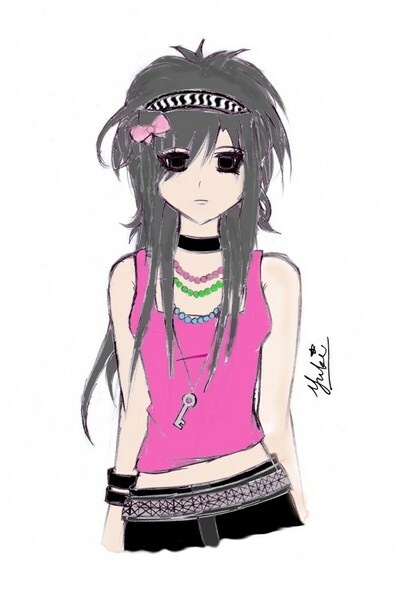 Kyraa looked down, seeing her shorts and tanktop. She gave a sly smile to her sister. "Haha. I'm going to get dressed, and you better too." Angelicaa sighed, then nodded. "Just cause your older..." She mumbled. Kolby crossed his arms, trying to stay out of the cold, but of course, it was no use. Kodi got dressed, slipping on a pair of shorts, an old t-shirt, and a pair of black high-top sneakers.. She didn't care if it was cold, she would just slip on jacket and call it good. She then attempted to put her make-up on, only getting to her eyeliner, and foundation before giving up. She then slipped on her jacket, and headed for the door, shivering as she opened it - she simply sucked it up, and started walking. Kyraa changed into a pair of jeans, a shirt and then a thick leather jacket. She then hopped into the bathroom, while Angelicaa was showering. "Don't take so long!" She snapped, then started to put on her daily routine. Eyeliner, Mascara, Blush, Eye shadow, foundation. Then finished. She looked back and heard the water stop, and yelled once again. "ANGEL!" Angelica went into the shower when she heard her sister talk to her. "Yeah yeah." She rinsed quickly, thinking to shower again when she gets home. She turned off the tap, then stopped to think. A voice irrupted her thoughts. "I'm coming, jeez." She replied. Angelicaa waited until her sister exited, then got out and got dressed. She put on a pair of track pants, a tank top then a jacket. She got out her make-up and applied only a waterproof mascara, then she was off. "Ready?" She said, as she stepped out of the bathroom door. Kodi shivered, it was so cold! Why did it have to be cold? It was early spring, and it was still only fifty degrees! She was freezing! She sighed, then looked down. I went off to school without you, and you can do whatever. I'm not going to be late just because of you. After, she rushed off, mumbling to herself. Angelicaa scanned the room, seeing a yellow post-it note. She read it carefully, then glanced at their clock. It read 8:11. She ripped the note, swung her bag on, and started to run. She saw Kyraa at then end of the street, and it motivated her to run faster. Kolby had finally made it to school, managing to get into the school before the bell rang, and got to his locker, quickly grabbing his books and shoving his bag into the locker, and growled as the bell suddenly rang. Kodi had just made it to campus when the bell rang, she jumped softly, then ran into the school, hoping to avoid the crowd of kids that rushed into the building. She managed to get to her locker, grabbed her books, shovered her bag into the locker, and sighed. Kyraa reached the school as the second bell had rang. She growled, then felt a hand land on her shoulder. She panicked, and flipped the person onto the cold hard cement floor. She turned, and gasped. "Angelicaa!?" She squealed. Angelicaa finally caught up to Kyraa as she reached the school. The second bell rang a moment later. She put her hand on Kyraa's shoulder, but a moment later, she was onto the ground, with her breath knocked out of her. Angelicaa heard her sister's voice and saw her shock. She winced, but then came out with a sarcastic "Aladin?" To her sister. Kolby quickly slid into his first hour class, managing to beat the bell. Kodi had not been so lucky, she was late. She growled to herself, "Not again!" She then tryed to slip into her first period, luckily, the teacher was not there.. yet. Kyraa sighed. "You know you shouldn't scare me!" She yelled. The angel rubbed her temples, then offered a hand to help her sister up. Angelicaa winced again, as though she was in pain. A hand appeared in her vision a moment later, and she took it. As she got up, her head was spinning. "Is the world spinning to you...?" Ericka sits at her desk, and starts on her work, ignoring everyone. Gwen leans against the wall, talking with her friends. Kyraa looked at Angelicaa. "No. Now get to the nurses office." She walked away, leaving Angelicaa all alone. Angelicaa nodded, then picked up her bag. She walked normally, to the nurses office. Kolby just basically had zoned out, putting his head in his hands boredly. Kodi was writting down notes, but then stopped and sighed. Gwen laughs, and looks at the teacher. 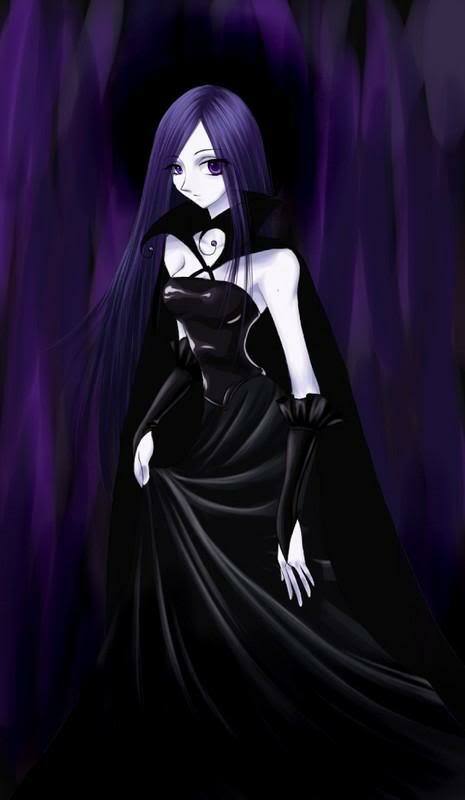 "We're leaving," She growls, and walks out of the room, brushing past everyone. Ericka sighs. "Ignore her. She only wants attention," She whispers. Kyraa entered her first class, interrupting everyone. "Sorry." She said outloud. The angel gave her teacher a note, then took her seat. Angelicaa sat down on the sofa at the office, with her head spinning. Ericka nods to the other angel, and leans back, listening to the teacher, having finished the day's work. Kodi said softly, "Most people enjoy attention.. some more than others apprantly." Kyraa looked at the guy named Kodi. "Hey. I heard that." She snapped. Ericka nods. "That's why she went to the Demons. They get more attention in her opinion." Kyraa listens in, enjoying the gossip. Kodi sighed softly, then went back to writing notes. Kyraa grunts, then takes out her notebook. Ericka looks at Kyraa, and shakes her head. "You shouldn't eavesdrop," She comments. "I wasn't eavesdropping, thank you very much." She retorts to the other Angel. Kodi shook her head, then grumbled. Ericka shrugs. "What else do you call listening to someone else's conversation," She replies. Kyraa got up, then asked the teacher for a hall pass. Kodi shook her head again. Kyraa closed her classroom's door, then headed towards the nurse's office, checking up on Angelicaa. Ericka listens to the teacher, as she writes more notes on the board. Kyraa approaches the door, then opens it, seeing her sister's pale face.